Judge Kavanaugh also has a federal court ruling on abortion we can look to – his dissent in the Garza v. Hargan case, in which the court ruled that the U.S. government could not block an undocumented immigrant from obtaining an abortion that she wanted, and that she followed Texas law to obtain. Judge Kavanaugh’s dissent essentially argued that the U.S. government detaining a young woman to keep her from getting an abortion was not an “undue burden” and was, therefore, in line with the standards set by Supreme Court on access to abortion. (He also came close to arguing that she had no real constitutional rights as an undocumented refugee, something not in line with the 14th Amendment). This is clearly not a judge who will put precedent or the experiences and needs of pregnant people, above his own ideology. 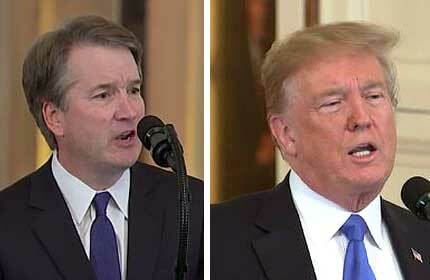 Judge Kavanaugh also authored another dissenting opinion in which he sided with an anti-abortion organization that claimed even filling out a form to exempt it from providing birth control to its employees was a violation of its religious freedom, and that was more important than the employees’ rights to health care. The Federalist Society also touts Kavanaugh’s hostility to the Affordable Care Act as one of the key reasons to appoint him to the Supreme Court. So, if you want to support a person’s decision to prevent a pregnancy, to obtain an abortion, or to carry a pregnancy safely to term while accessing affordable health care and prenatal care, Judge Kavanaugh is most certainly NOT your guy. And with a lifetime appointment at age 53, his anti-choice ideology will impact generations of patients seeking out comprehensive reproductive health care. It’s important to remember that despite the claims of “judicial activism” by abortion opponents about the 1973 Roe v. Wade decision, it was a 7-2 decision from a bench of all men, most of whom had been appointed by Republican presidents. The decision that legalized abortion in the United States was made not by a bunch of feminist activists, but by legal scholars who considered the rights, lives and experiences of women in our society, the interests of the state in these matters, and the medical science and evidence on the issue. They likely also considered the fact that abortion was not new to the American people, and had been a part of many pregnant people’s experiences throughout the history of this country, albeit usually in unsafe and illegal ways. Abortion is a common experience for many American women, and supported by the vast majority of Americans, no matter their personal beliefs. That the court would be stacked with a handful of justices who would place their extremist and rigid ideology over the rights, beliefs and safety of the American public is unacceptable. Judge Kavanaugh is the president’s second selection to the Supreme Court, following the appointment of Justice Neil Gorsuch in 2017 to a court seat held vacant for 422 days in a blatant power grab by Senate Republicans. During Justice Gorsuch’s first term on the court, he sided with the majority in cases that overturned labor law precedent; and that issued decisions on reproductive rights and on immigration that seemed to work backwards from the desired conservative outcomes; rather than consider the law, the court’s role as a check on the executive and legislative branches of the government, and the rights of the American people. There is no reason to expect Judge Kavanaugh would be any different or do anything to undermine the far right’s blatant attempts to turn the Supreme Court into a hyper-partisan institution that will rubber stamp their policies designed to consolidate power and wealth in the hands of the few by oppressing the many. That should be of concern to all people who believe in the promise of our democracy, no matter their political party, and a key reason to oppose Judge Kavanaugh’s nomination. Tara Romano is the Executive Director of NARAL-Pro Choice North Carolina.